Outings are arranged for members usually every month. They are organised at cost price, with transport, tickets and gratuities included. 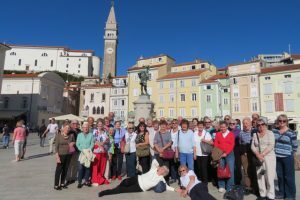 Also,a short four or five day holiday is included in the itinerary every year and previous destinations have included Northern Ireland, Tuscany, Madrid, Slovenia. Ideas for future outings are welcomed from members. Please email the Outings Co-ordinator for information on holidays or future outings. 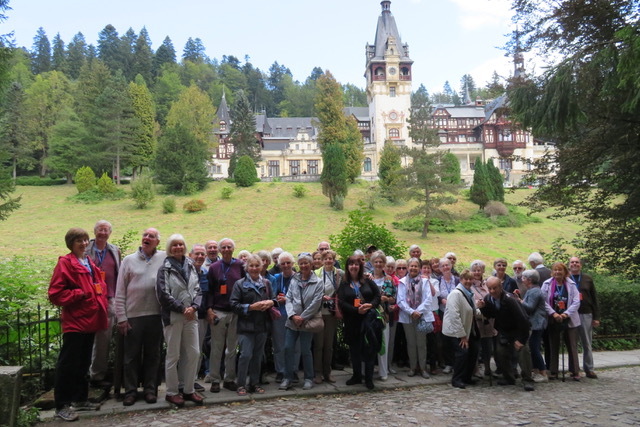 A group of 38 of our members had a memorable 6-day holiday based at Lake Bled. There were many highlights including a visit to Postojna, one of the world’s largest cave systems and a wonderful day at Piran, a medieval town with a Venetian influence, a typical Mediterranean look and, on the day itself, a very Mediterranean climate. To Bucharest, a city of extremes,then to Transylvania in the Carpathians, an area of natural beauty and home to wonderful scenery, Dracula’s Castle (quite ‘sort of interesting’) and Peles Castle, (as in the photo) a truly wonderful 19th century chateau filled with highly decorated rooms, set in the most picturesque setting. A most enjoyable holiday with a happy group of members. 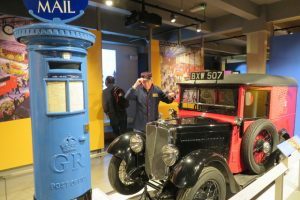 In November 2017 we visited The Royal Mail Underground Railway and Museum. One of our members taken back to yesteryear!